Remote control thermostats are quickly becoming incredibly popular - and for a good reason. These programmable thermostats take efficiency of time and energy to a whole new level. With a smart thermostat system, you can control your climate remotely, which means that you can adjust the temperature inside your home from a device, like a smartphone or tablet. With some of these systems, you can get a reading of what the climate is inside your home, so that you can adjust it accordingly. This can give homeowners a lot more freedom and versatility - it can also lower energy bills and maximize the lifespan of your HVAC unit. Here are some remote control thermostat benefits for homeowners. 1. Convenient. It is a lot more convenient to control and operate your thermostat from a device than to constantly fiddle with your thermostat hands on. What if you are on a different floor in your home? What if you don't want to get out of bed? What if you aren't home? Having the ability to remotely operate your thermostat can give you unprecedented convenience - convenience that you won't find with traditional thermostats. 2. Intuitive. 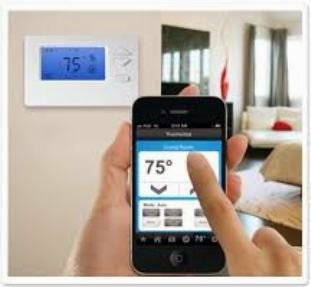 With some of the WiFi thermostats for iPhone and Android on the market, you can have a totally intuitive interface to control and operate your HVAC system. Oftentimes, these systems are totally digitized, so all you have to do is use your finger to swipe and scroll through different temperature settings and control options. In fact, these interfaces are so intuitive that you don't need any previous knowledge of computer interfaces to learn how to operate them - they are all self explanatory, so they are perfect for any homeowner. 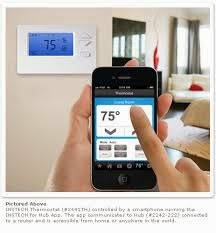 You may even find that your remote controlled thermostat is smarter and more intuitive than your old thermostat. 3. Lifespan increase. One of the beautiful things about programmable thermostats is that you won't need to use your HVAC system as often. When you can control when, and for how long, your cooling and heating system runs, you can place less impact on the vulnerable parts of the system, like the compressor unit and the fan motor. In the end, you will be faced with less expensive repair bills and you won't have to update your system for a long time. 4. Savings. Another one of the biggest benefits of a remote controlled thermostat is that you can save money on your monthly energy bills. This is especially important during those particularly brutal summer and winter months. If you purchase a remote thermostat that you can control with your device, you may even get alerts when your system is running more than it has to run - you can even turn the device off from a satellite location. 5. Efficiency. Indeed, programmable thermostats are incredibly efficient. However, remotely programmable thermostats are even more efficient. Not only are you saving time and money - you are also saving precious resources. In the end, if you are looking for a smarter system - that will have less impact on the environment - you probably want to invest in a remote controlled thermostat for your home.